Email marketing isn’t just about creating a compelling copy and optimizing your subject line. Email deliverability plays a key role in the success of your email marketing campaigns. Successful email marketers make sure their emails are not just mobile-optimized, but also optimized for different email clients (Gmail, Outlook, Yahoo!, etc.). In this article, we’ll examine ways in which you can optimize your email campaigns for different email clients. But before we get into that, let’s take a quick look at the most popular email clients. Naturally, some email clients are way more popular than others. 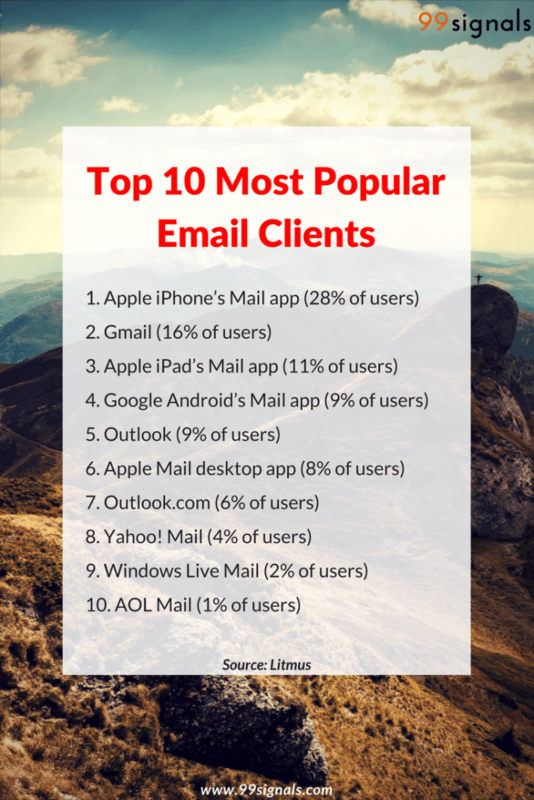 According to Litmus’ research of 1.06 billion email opens, these are the 10 most popular email clients. Now that you know which are the most popular email clients and ones you should prioritize for your email campaigns, let’s dive deeper into what you can do to ensure your emails are optimized for these email clients. An easy way to help ensure your emails make it into your subscribers’ inboxes is by creating a plain-text version of all your emails. Majority of the email clients expect trustworthy emails to have both rich and plain-text email versions. Most email marketing service providers (ESPs) let you create plain-text version of your email within their email editor. ESPs such as AWeber automatically create a plain-text version of your email. Most email clients will block images by default. This means that when someone opens your email, the images won’t load unless they opt to do so by clicking a button or changing their default settings. Adding alt text to your images helps your subscribers understand your message even if they don’t see the images. 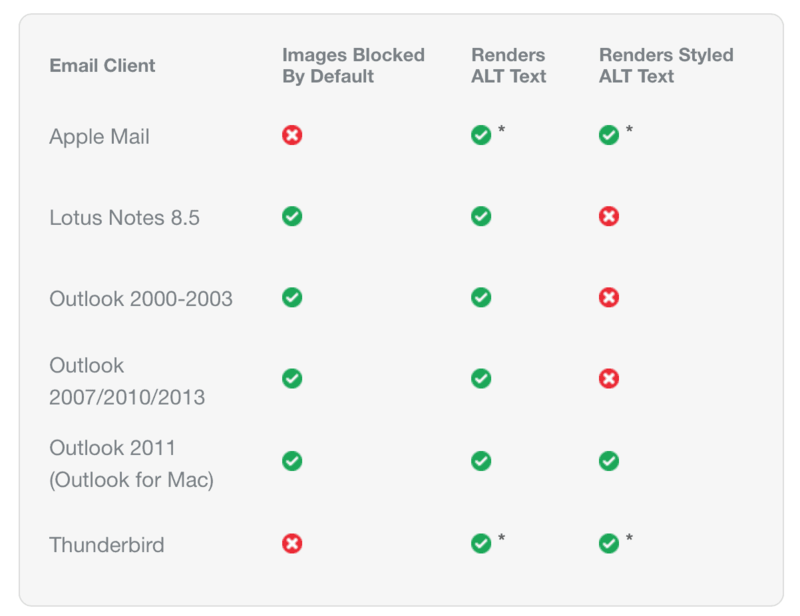 Here’s a chart from Campaign Monitor showing which email clients block images, render alt text and render styled alt text. Email clients like Gmail, Outlook, and the iPhone Mail app display the first few lines of text from the body of your email alongside the subject line. As a result, the first few lines of text could be the deciding factor whether the recipient opens your email or ignores it. Setting a specific height and width for your images will help ensure your email design maintains its structure even when images are blocked by email clients. It also sets a container for your alt text in email clients that block images by default. Most ESPs allow you to resize your images. Resize your images to the specific size you want them to be before sending the email. Some email clients don’t support HTML, so it’s important to include a link to an online/web version of your email. Check out this list of what’s supported across different email clients, including link elements, style elements, texts, etc. 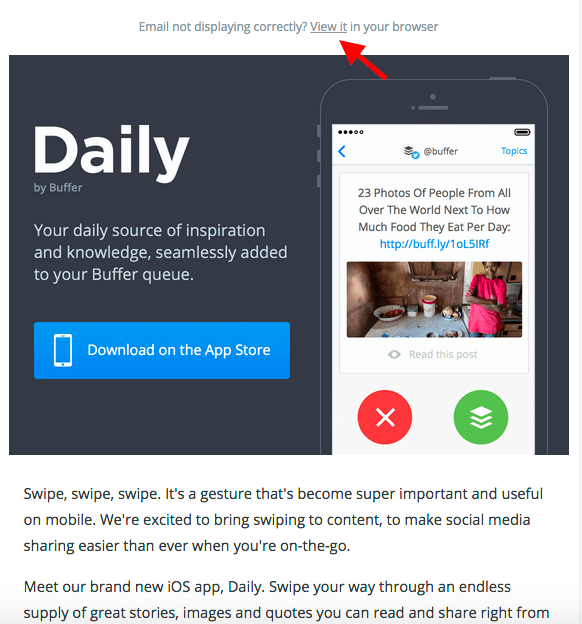 Here’s an email from Buffer which has option to view the email in your browser. By including a link to the web version of your email, your subscribers whose email client or device doesn’t support HTML can still see your email the way it was meant to be seen. People will access your emails from different environments, so it’s important that your links have absolute paths. If recipients are outside your company network, the relative links (when the link isn’t a full website address) can break and make your content unavailable to view. Similarly, make sure all your images have absolute URLs as well. Your subscribers won’t be able to see the images in your email if they have relative paths. Even if you have think you’ve optimized your email for different email clients, it’s always a good practice to preview and test your email before sending it. Send out a test version of your email to different email clients, just to make sure they’re working properly. AWeber Review: Is it Still the Best Email Marketing Service Provider? AWeber vs MailChimp: Which Email Marketing Service is Better? ConvertKit Review: Should You Switch Your Email Marketing Service Provider? I actually never thought of the importance of thinking in terms of email clients. After reading the article, I’ll definitely start implementing these recommendations. Although I have been using some of them already, it’s better to go for more of them, if that means hitting the inbox of my leads, prospects and customers.